The man charged with the murder of Labour MP Jo Cox has appeared in court and been remanded in custody. 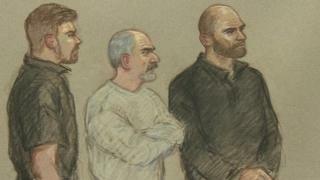 Thomas Mair gave his name as "Death to traitors, freedom for Britain", when he appeared at Westminster Magistrates' Court. Mrs Cox, 41, was shot and stabbed in Birstall, West Yorkshire, on Thursday. Members of her family visited the scene on Saturday to read floral tributes and thank gathered crowds for their support. Speaking in the village's market square Kim Leadbeater, Mrs Cox's sister, described the MP as "perfect". Ms Leadbeater said the tributes paid to her sister had "genuinely made a difference" and helped the family through some "dark times". "I could not watch the overwhelming outpouring of love without speaking on behalf of Jo," she said. "Jo would want us to focus on that which unites us not which divides us. She will live on through good people in the world." Mrs Cox, who was married with two children, was about to attend a constituency surgery when she was killed. A 77-year-old man, who came to her aid, was also injured and remains in a stable condition in hospital. Mr Mair, 52, faces charges of murder, grievous bodily harm, possession of a firearm with intent to commit an indictable offence and possession of an offensive weapon. The defendant, who was wearing a grey tracksuit, refused to give his correct name and did not reply when asked to confirm his address and date of birth in court earlier. He did not enter a plea and is next due to appear for a bail application hearing at the Old Bailey on Monday. His lawyer, Keith Allen, told the court legal aid had been applied for. The venue chosen for Thomas Mair's first court appearance was the most important magistrates' court in London. Deputy Chief Magistrate Emma Arbuthnot was sitting. Reporters from the broadcasters and Sunday newspapers and from overseas packed the press seats at the back. As is almost always the case, the hearing was brief, but it had a key moment of drama - the moment the man in the dock was asked his name. He stood, as asked, for what is normally one of the most mundane parts of the proceedings. Not this time. "My name is death to traitors, freedom for Britain," he said. Asked to repeat it, he said the same thing. Then he fell silent until he was taken from the dock and driven off to prison. Vigils were held across the country on Friday evening in memory of Mrs Cox. Earlier in the day, David Cameron and Jeremy Corbyn visited Mrs Cox's Batley and Spen constituency. The prime minister said the country was "rightly shocked" by her death, while the Labour leader described the former aid worker as "an exceptional, wonderful, very talented woman." Parliament will be recalled on Monday to allow MPs to pay further tributes. A fundraising campaign started on Friday by friends and family of Mrs Cox has already raised more than £500,000. The funds will support three causes her husband, Brendan Cox, said were close to her heart, including the The Royal Voluntary Service, HOPE not hate and The White Helmets.